You’ve all seen the 2020 Toyota Supra’s exterior by now. Some of you like it and some of you think it’s boring, but none of that matters. What matters is the hardware, which is why I crawled under the Supra at the Detroit Auto Show to get a look at the car’s mechanical bits. Here’s a look at how they compare to those of the BMW Z4 and BMW 3 Series. And actually, looking under the new Supra, I spotted a number of other similarities to the new 3 Series, like these black plastic aerodynamic guides bolted to the lower control arms of the five-link rear suspension. 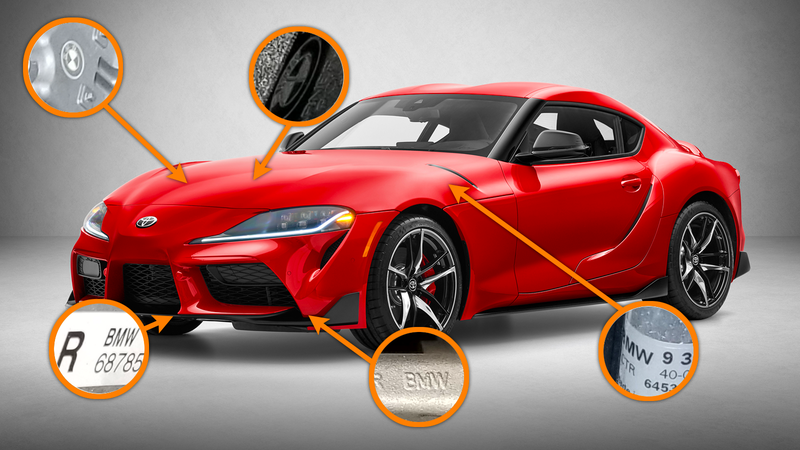 And in fact, the new 3 Series’ five-link suspension control arm is marked with a sticker in the same location as that of the Supra—a sticker with the same “6886448" number on it, though on the BMW, that number is followed by “04" versus “05" on the Supra. (I’m not sure exactly what those last two figures represent). You’ll also notice that both cars have wires that reach down and connect at the bottom of the rear differential cover to what looks like a temperature sensor. On the other end of the wire on both the 3 Series and the Supra, you’ll see the same style connector on a bracket that sits just to the right of the diff. The Supra’s front suspension is a double-joint spring strut design, similar to that of the 3 Series. Looking at the knuckle, you’ll see a single strut connection at the top (this is shown better in the image below), and two connections from two links towards the bottom—a design that yields a virtual steering axles, which I described in my 3 Series deep-dive. Here’s a close look at the strut, as well as the long sway bar link, and what appear to be sensors for the brake wear indicator and the ride height (as the Supra has adaptive damping called “Adaptive Variable Suspension”). So the engine bay is basically exactly the same as the Z4's, and the suspension likely is, too. I only had suspension photos of the new 3 Series, but those showed quite a bit of commonality between the Bavarian sedan and the new Supra, as well. We knew the Supra shared a platform and powertrain with BMW, but the main takeaway here is that, looking at the Supra, it’s fairly obvious that it pretty much is a BMW when it comes to the main hardware. According to Haushalter, what Toyota did was alter the tuning on things like steering effort and suspension damping. Here’s the floor farther underneath the car; it’s fairly flat, aside from the tunnel for the giant exhaust pipe. Correction Jan 21, 2019 9:37 P.M. ET: The heat exchanger in the front outer grille is likely for the liquid to air charge air cooler in the car’s intake—not liquid to liquid.